Four Orleans Parish School Board employees who work in the office that manages its five direct-run schools are involved in a bid by an independent nonprofit to turn them into charters, according to documents. So is their former supervisor, who oversaw those schools for the district. She quit her job Thursday to become CEO of the new nonprofit, four days before the application deadline to take over the schools. Their participation raises questions of conflicts of interest. Generally speaking, public employees can’t be involved in decisions in which they have an economic interest, nor can they be involved in bids for contract work with their agency. For two years following their public employment, they can’t contract with the same agency to do the same work. Concerns over such a conflict led school district leaders to tell Nicolette London, who was the district’s chief of Local Education Agency and Network Schools, to steer clear of discussions at the central office involving charter applications. That was based on a hunch she was involved in the charter bid, Chief of Staff Adam Hawf said in a February interview with The Lens. He didn’t elaborate on what led to that belief, and he said he never actually asked her about it. Turns out he was right. London is named as the CEO in the application from a group called ExCEED Network Schools Charter Management Organization. The school district office that oversees the schools in question — the one London led — is also called ExCEED. The application was due Monday and was released to the public on Tuesday. The nonprofit was created in January. A week later, it submitted a letter of intent to take over the last five schools in New Orleans that are directly run by the Orleans Parish school district. The five principals of those schools have all signed on to the effort, and they would remain if the school district allows ExCEED to take over the schools. In an interview Tuesday, London said she didn’t work on the nonprofit’s application. But she said she did know in December about plans by the five principals to turn the schools into charters. By quitting before the application was due, London may have stayed within the bounds of state ethics law. A 2006 opinion from the Louisiana Board of Ethics advised a Recovery School District employee that she could work at a charter school as long as she quit her state job before the nonprofit applied for the charter. Margaret Griffon, who is executive director of network schools for OPSB, would serve as executive director of academics for ExCEED. Shelia Banks, who is an assistant director of network schools for OPSB, would serve as assistant director of academics for ExCEED. Toni Pickett, who is also an assistant director of network schools for OPSB, would serve as assistant director of academics for ExCEED. Leroy Harris, Jr., who is the director of finance for direct-run OPSB schools, would be the executive director of finance and operations for ExCEED. The Lens has made multiple attempts to reach them. Griffon did not return multiple calls seeking comment. When reached in early February, Banks said she was still a district employee and knew about the charter group, but wasn’t assisting with the application. Harris twice referred The Lens to the district, once in February and again Tuesday. Reached by phone at her office Tuesday, Pickett also referred The Lens to the district. The Lens asked a spokeswoman for the school board whether they were all still employed with the district. She didn’t answer except to say that Griffon had assumed London’s responsibilities. Hawf said he was glad the district had established a safeguard to protect the integrity of the charter application process, referring to the district’s decision to keep employees in that office from being part of discussions about the chartering process. Based on the circumstances, the school district should seek an advisory opinion from the state Board of Ethics, said Robert Scott of the Public Affairs Research Council of Louisiana. The Ethics Board makes recommendations based on state law and the circumstances of each case. “If they’ve had to go so far as to create a firewall and are trying to get out in front of this thing from an ethical standpoint, why not take the extra step?” Scott asked. He said the district should do whatever it can to avoid any problems if ExCEED ends up taking over the schools. For example, Scott said, the district wouldn’t want to find out in the summer about a conflict because at that point, it could delay the opening of the schools. If the schools are chartered, New Orleans would become the first city in the U.S. where the elected school board doesn’t directly run any public schools. Every school would be a charter open to any child in the city, although some require an admissions test. Catherine Robin, whose son is in third grade at Mary McLeod Bethune Elementary School of Literature and Technology, said she is pleased to hear ExCEED is planning to keep the principals at the schools. Robin recalled Superintendent Henderson Lewis Jr. speaking at a parent meeting at Bethune in January. Lewis introduced district staff as the “ExCEED” team, later clarifying that he was referring to the district’s office, not the nonprofit by the same name. When parents pressed him for details of who is leading the nonprofit, he told them he didn’t know and didn’t have a say in the matter. “As superintendent, I can’t tell you that Ms. London will be the leader,” he told them. In a February interview, Hawf said that London and the other employees in her office had been removed from the charter application process since mid-December. “No person associated with the network’s ExCEED office, including Ms. Nicolette London, has been permitted to participate in any process or discussion with the cabinet, superintendent or otherwise regarding the charter school application process,” Hawf said. He said district staff sought legal advice a week after Lewis announced the principals of the five traditional schools had expressed interest in turning their schools into charters. At the meeting were district staff, its attorney and Sharonda Williams, a former city attorney now in private practice. “We sought legal guidance based on the possibility that she [London] could be involved,” Hawf said. Hawf said the district has not sought an opinion from the Ethics Board. He said the district’s attorneys consulted with ethics staff attorneys and reviewed advisory opinions. The restrictions on London and others in her office were based on a legal memo by Williams, Hawf said. The district would not provide the memo to The Lens, saying it’s protected by attorney-client privilege. In January, Hawf told The Lens he didn’t know of any district employees involved in the ExCEED nonprofit. He didn’t mention the decision to remove London and other employees from the charter application process. The lawyers’ advice, Hawf said, dealt “with what we need to do to protect the sanctity of the charter application process.” That meant cordoning off London and her employees. In practice, he said, the restrictions didn’t have much effect on employees other than London. She was asked to leave senior-level meetings if the charter application process came up. There are different types of charter schools, and the process of granting a charter depends on which type. Teachers at a school can apply to convert a school to a charter. In the past, those conversions required a vote of staff and parents, but now the district decides whether to require it. This year, it isn’t. Outside groups also can ask to take over schools. For the past several years, the Orleans Parish School Board has invited applicants to take over its schools and to open new ones. That’s the process under which ExCEED is trying to take over these schools. To prevent corruption, public employees must follow rules laid out in the state’s Code of Governmental Ethics. The Orleans Parish School Board has a similar policy. Both include rules about what public employees can do post-employment. In general, people must wait two years after leaving a government agency before working for it as a contractor if it involves the same job duties. They must also wait two years before being paid for work involved with a “transaction” that they dealt with while employed at their government agency. Ethics rules are in place so employees don’t make a decision as part of their government job that can benefit them or their families later. The rules are in place so employees don’t make a decision as part of their government job that can benefit them or their families later. The Louisiana Board of Ethics ensures public employees comply with the law. Penalties for violating the law include the removal, suspension, or the demotion of a public employee; a reduction in pay; or a fine of up to $10,000. We didn’t find an opinion that addresses the involvement of school district staff in creating a charter school. The closest advice we found to the current situation was a 2006 opinion advising an employee of the state Recovery School District that she could work for a nonprofit charter school long as she quit her state job before the nonprofit applied for the charter. That appears to be what London did. She told The Lens she resigned from the district on March 2 and accepted the CEO position the same day. London told The Lens she resigned from the district on March 2 and accepted the CEO position the same day. She said she wasn’t aware of the conflict-of-interest rules about accepting outside employment after working for the government. “I’m going to have to look at that and see,” she said. Similarly, a 2010 advisory opinion concluded a Department of Education employee could lead a new charter school as long as she did not oversee 9th grade services because that was part of her job when she was with the department. 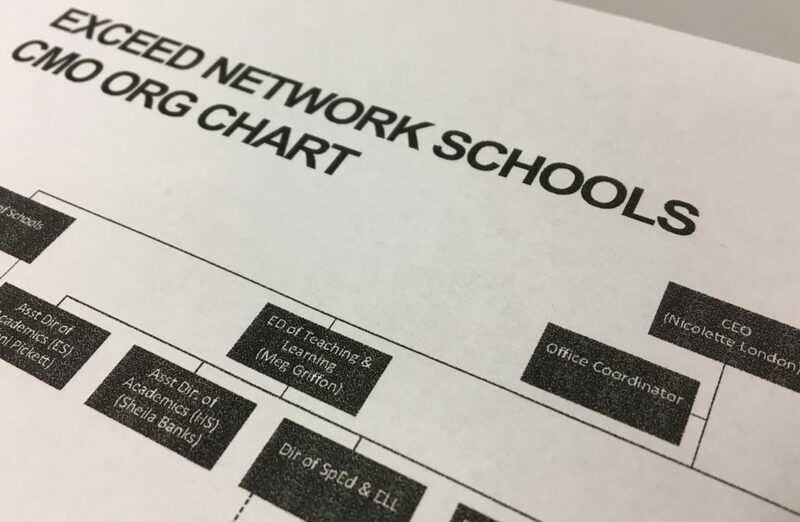 The ExCEED application doesn’t include job descriptions for the four OPSB employees, so it’s not clear whether their responsibilities at the charter network would overlap with their current jobs. We also reviewed violations of ethics law. In 2004, the Board of Ethics ruled that the former risk management administrator for the Orleans Parish School Board had broken the law. A month after he left his job, he contracted with the school district to do the same work. That violated the law because he didn’t wait two years. He was fined $1,000, but only had to pay $750 as long as he complied with the law in the future. The law takes into account how much power a public employee has. There are tighter restrictions on what people can do after leaving their government jobs if they were considered agency heads or were in a position to shape policy. ExCEED has named Leroy Harris Jr. as its finance director. At the Orleans Parish School Board, he oversees finances for the five direct-run schools. His responsibilities include “establishing financial policy and procedures,” according to his resume. In 2005, the Ethics Board advised former ReNEW Schools CEO Gary Robichaux, a principal at the time, that he could move from a school run by the Louisiana Department of Education to a charter school because the charter organization was another government entity. Kathleen Allen, administrator for the Louisiana Board of Ethics, said it’s the responsibility of the employee, not the public agency, to deal with potential conflicts of interest. The public agency would have to submit a confidential report to the ethics board if it suspected a violation had occurred. Orleans Parish School Board policy requires employees to disclose potential conflicts to the superintendent. Hawf said no employee had done so. With applications now in, charter applicants are meeting with school staff and parents this week. Lewis will decide whether his former employee will take over those schools, with the approval of the board. He has said he expects to make recommendations in April.